Remember When Hillary Said She 'Would Consider Obama For VP? It was March, 2008. And it was a desperate tactic as she saw her campaign failing. We are at that stage now in this election. She sees her support slipping away. She sees the huge amounts of money the PEOPLE are giving to Bernie meaning he isn't going to run out of money and is going to go all the way to the Convention. Meantime, again like last time, she is running out of money. So what should she and her backers do to stop this unworthy challenger from interfering with her dream? Tell his supporters they may as well join her as it's 'all over but the shouting'. When she suggested she would 'consider' Obama for the VP slot, she was TRYING to create the impression that it was all over for his campaign and she was now taking control. As an Obama supporter then her arrogance OUTRAGED me, her dismissal of the Democratic Process disgusted me and made me work even harder for Obama. I believe I flipped my FIL to Obama from Hillary that night. How dare they attempt to usurp this campaign AGAIN with the same old tactics that FAILED last time. It's difficult to express to tone deaf people how INSULTING it is to voters. She knows that for Bernie the worst part of the campaign is over. She sees the internals, his rising support among minorities as women as more and more people get to know him, and her own diminishing. So they are trying desperately to discourage Bernie's supporters having learned NOTHING from last time. Not ONLY were we NOT discouraged by her arrogance back then we were ENERGIZED and we WON in the end. And after WE won, it was Obama who got to decide what slot he would consider her for. This campaign is a repeat of 2008 from the vile use of 'race' and 'gender' to the arrogant assumption that we Democrats are too dense to see what they are up to. That is worth watching again as a reminder of how she runs her extremely negative and divisive campaigns. She has the Corporate Media aiding and abetting her, has had all along. But despite the Powerful Forces aligned against him LOOK WHAT BERNIE HAS ACCOMPLISHED. We are not falling for it. We didn't fall for it last time. On to the Convention and the Nomination Bernie! I am actually encouraged by the now familiar signs of desperation. Actually it reads like what it is, a victorious Obama V Hillary supporter speech. "She sees her support slipping away." Exsqueeze me? What universe are you living in? Same thing Hillary supporters said to us back in 2008. Uh huh. Nice vectoring. I'll let you fly off on that tangent by yourself. "just let's say I am 'more experienced'"
This is the new mantra apparently. I guess this is the equivalent of Henry V's St. Crispin's Day speech -- rallying the troops. Sanders (and his supporters) are in it to win it. Period! It's like a parallel universe here. 2. Actually it reads like what it is, a victorious Obama V Hillary supporter speech. 3. "She sees her support slipping away." Exsqueeze me? What universe are you living in? She just cleaned Sanders clock on Super Tuesday. 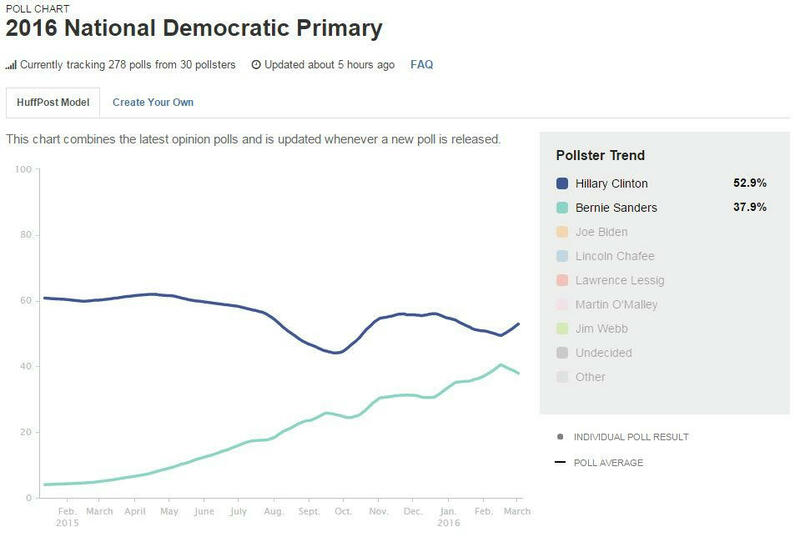 Clinton has increased her lead over Sanders nationally. 7. Same thing Hillary supporters said to us back in 2008. By March, 2008, Obama had opened up a 5+ point lead he never relinquished. 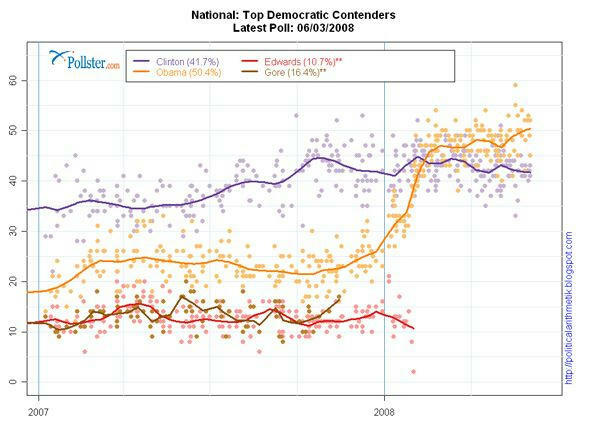 Any Clinton supporter who was claiming that Obama support was "slipping away" was delusional. media coverage which helped enormoushly, he also had the backing of the Dem Party. IF he had been sabotaged which we expected with Bernie,, by the DNC and the Corp Media, those numbers wouldn't even come close to where Bernie is now. It is simply AMAZING how Bernie has OVERCOME all the Powerful Forces' attempts to derail his campaign and pushed on until he finally got a LITTLE coverage and even that LITTLE peek at who he is caused, pay attention please because you are missing some pretty important signs here, caused a JUMP in the National Polls to where he went from at most, about 30% to BEATING Hillary NATIONALLY. Not just in one poll, but in several. Given the effort to stop him and that tiny glimpse during the debabes that huge jump in the polls, is what is scaring Hillary because from here on as more people get to know him, he WILL beat her and she knows it. 10. Uh huh. Nice vectoring. I'll let you fly off on that tangent by yourself. with Hillary and her supporters. The sense of Deja Vu is overwhelming. 16. "just let's say I am 'more experienced'"
That's certainly one way of putting it! 11. This is the new mantra apparently. "Bernie is gaining support Hillary is losing it and those are the facts"
"she is losing the minority vote." "AAs, Latinos, Women are deserting Hillary and signing on with Bernie and that will only continue as the campaign goes on"
"AAs are fleeing Hillary's campaign in droves"
'those who choose NOT to support Hillary who are growing in number every day." 14. I guess this is the equivalent of Henry V's St. Crispin's Day speech -- rallying the troops. 15. Thanks for the kick! 5. Sanders (and his supporters) are in it to win it. Period! 6. It's like a parallel universe here. likes her. Nearly everyone, who knows about him, likes Bernie. I see Bernie signs in isolated rural areas and in small towns, but plus bumper stickers. But not a single Hillary or Trump sign. And yet, this is the state she represented as a Senator.